7:30am – Campers get up and greet the day! Rise and shine! Counsellors come and greet campers to start the day! Campers have an hour to get ready for breakfast. Some campers take more time than others – after all, not everyone is a morning person! If there is time before breakfast the counsellors always have some fun filled activity up their sleeve, whether it’s an early morning nature walk, a visit to arts and crafts or a trip to the on site playground. Meals are always a fun event at camp. Each group will sit together at a circular table where the campers have a chance to meet with their group and discuss the day. Counsellors serve campers their favourite foods (campers are, after all, on vacation). As with all meals, there are always lots of yummy options for breakfast – cold cereal, fruit and toast are available every day. A hot option for breakfast might include eggs, bacon, pancakes, waffles, muffins or hash-browns. During breakfast campers might just spot a counsellor who has their elbows on the table, and make them do a song and dance! The dining hall is usually quite active – there is a lot of singing and dancing as the meal is being eaten. Campers who prefer a quieter place often sit on the patio with their groups. The programming staff arrive to announce the morning activities with a song (sometimes even a dance!). 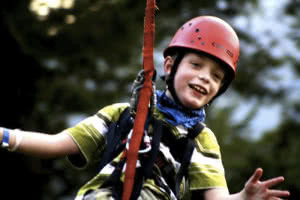 Campers get to choose the activities they want to try. During a regular program period campers can take part in a number of activities in one of the many program areas. There are about 4 different options campers can choose from. 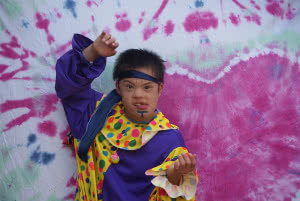 Some favourites include: tie-dying, swimming, canoeing, rock climbing, giant swing, mask making, karaoke, wheelchair sports, hockey, shaving cream fights, silk screening, and so much more… If a camper can’t narrow down their choice to one activity, they can always spend time at each of the activities. Sometimes we will run clubs during Regular programs. These might include: drama club, song writing club, nature club, rescue club, yearbook club, Harry Potter fan club or anything else our campers are interested in that week. Careful not to put your elbows on the table, or you might have to sing a song! At camp even table manners can be fun, and there is a song for every occasion! Just like breakfast, we always have lots of different choices for lunch. Lunch favourites include: grilled cheese, macaroni and cheese, sandwiches, corn dogs, soup, veggies and dip, french fries and salads. 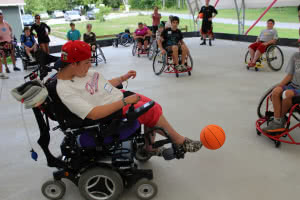 Most days there is an all-camp activity – something that everyone at camp can participate in. 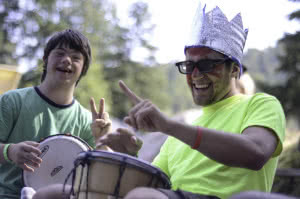 It’s a great time for campers to get to know other campers outside of their counselling group. The programmers always have an exciting activity planned that will connect with the theme of the week. Everyone meets for juice and a quick snack before they run off to the dorms for the rest break. This is a time when campers can relax in their room, listen to music, write letters home, chat with their new friends or watch a movie in a common area. During rest break we have designated rest break staff on duty. The staff are always ready to lend a hand (or an ear) to a camper who needs one. Once again we head to the dining hall for some grub! Programmers will show off their latest shenanigans to announce the activities for the next program period. Perhaps an epic singing contest will occur, or maybe a camper wants to make an announcement to everyone in the dining hall about their counsellors’ smelly feet! Common dinner meals include hamburgers, chicken strips, salads, chilli, stew, or pasta. If the campers didn’t have time to visit all of the program areas in the morning, they have another chance in the evening program block. A whole new set of activities is offered in each program area – campers are never bored at camp! Campers gather together before they return to the dorms for the night. It’s a time to wind down after the day’s activities, and chat with campers from other groups. Usually we have fruit and water for snack. Campers get ready for bed (it’s been a long day after all!). 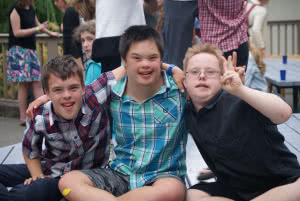 Counsellors stay with campers until everyone in the buddy group is soundly snoring! 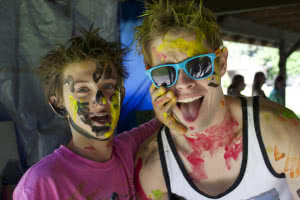 At this point the counsellors will sign out with two summer camp staff who are on duty at night. These two staff stay up during the night right outside of the doors to monitor the campers needs by checking on each group regularly and provide assistance where required. They will be there to assist in any way necessary throughout the night. Park Day: Around the middle of the week campers and staff will spend the day outside and have a break from the routine of regular programs and all camp activities. 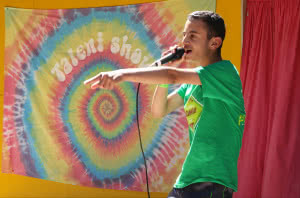 On Park Day campers get to choose their own adventure by participating in a wide range of activities throughout the entire day such as Tie dye and silk screening, Talent Shows, and watersliding. Banquet Day: The last full day at camp is always special as we have a camp banquet for dinner on the final night of camp! On this night campers receive special recognition for their years at camp as well as their awards from their counsellors for the week. The banquet is followed by an epic camper dance and a grad party for campers who are graduating from camp that year.